The earliest representations we have of the crossbow date from 400 BCE, in China. By 209 BCE the Chinese army had 50,000 crossbowmen who fought with mass-produced bronze weapons. These crossbows, which were an important weapon in war until rifles were invented, were usually mounted and could fire up to 650 feet. 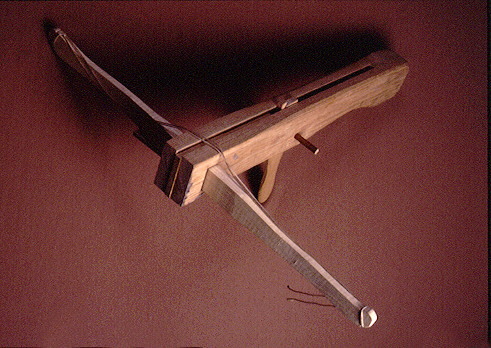 The first pictorial evidence of European hand-held wooden crossbows, like the one shown here, dates to about 1200 CE. Introduced from the East during the Crusades, they were initially outlawed by religious leaders who considered them to be inappropriate for Christian warfare, but their effectiveness in battle soon prevailed over theological concerns. Crossbows, used in war until the 17th century, are still usedfor sport today.